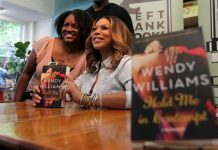 March 19 (UPI) — Wendy Williams says she’s living in a sober house due to her past issues with cocaine. “For some time now, and even today and beyond, I have been living in a sober house,” Williams tearfully told the audience. “You know I’ve had a struggle with cocaine in my past. I never went to a place to get the treatment. I don’t know how, except God was sitting on my shoulder and I just stopped,” she said. Williams said her husband, Kevin Hunter, and son, Kevin Hunter, Jr., were the only ones aware she was seeking help. “It’s been really interesting, this ride. Only Kevin and Kevin have known about this. Not my parents. Nobody,” she said. Williams said she practices pilates every day after work before attending several support meetings around the tri-state area. She returns to the sober house every night, where the doors are locked at 10 p.m.
Williams promoted her Hunter Foundation for drug education, prevention and rehabilitation, and urged others struggling to get help. She echoed her sentiments in a tweet Tuesday after the episode. “If you or a loved one is struggling with addiction, help is available,” the star wrote. Williams returned to her show this month following a two-month hiatus for health issues. She was diagnosed with Graves’ disease in February 2018 after fainting on-air during an episode of her show in October 2017.